Well, Leaguers... according to the counter, this is post number 2500. I was going to link to an article about the Chicago Bulls mascot getting sued for a high-five gone bad, but then I said "oh, that's post #2500. Perhaps something a bit more dignified...". Every time an anniversary comes up around here, I feel the need to do an Oscar aceptance speech in order to thank people. And I imagine, mentally, each of you begins playing the Oscar music in your head and is walking me off the stage by the second sentence. So I won't do that here. If you want to be thanked and feel you deserve it, you know who you are. Thanks. You're a peach. I'm a bit stunned to have reached 2500 posts. Sweet Christmas, what have I been doing with my life? Well, apparently when it comes to talking about myself, Superman, comics and other useless minutia, I have a surprising degree of stick-to-it-iveness. The Admiral would be both proud and ashamed, I think. Man, just to think... 2500 posts. And at least 4 of those were pretty good. It boggles my mind that you haven't been offered a book deal or won awards. Or that someone hasn't offered to pay you money to ghost write their memoirs. I, for one, am proud. I tell you what, anonymous. I think the internet owes me a huge sack of dough. 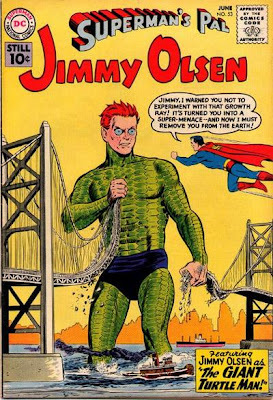 They can keep the awards, but enough money for a rocket car and a stack of Jimmy Olsen back-issues seems reasonable. I wanna know what kind of reward I get for reading most of those posts. Luckily for you, you reward is that you've gained the valuable insight and wisdom that reading the LoM provides. I know that you would gladly pay me for this sort of information, but I insist on providing this service for free to unfortunate people like yourself. Sci-Fi getting dumber thanks to super-heroes?